An increasing number of younger adults are making up the exodus of taxpayers from the state. New IRS data confirm that tens of thousands of prime working-age adults – including significant numbers of millennials – are leaving Illinois every year. Taxpayers, with millennials leading the way, are consistently voting with their feet and leaving for other states. While there is a general trend of Americans moving to the South and West, no state in the Midwest loses people at nearly so rapid a pace as Illinois. 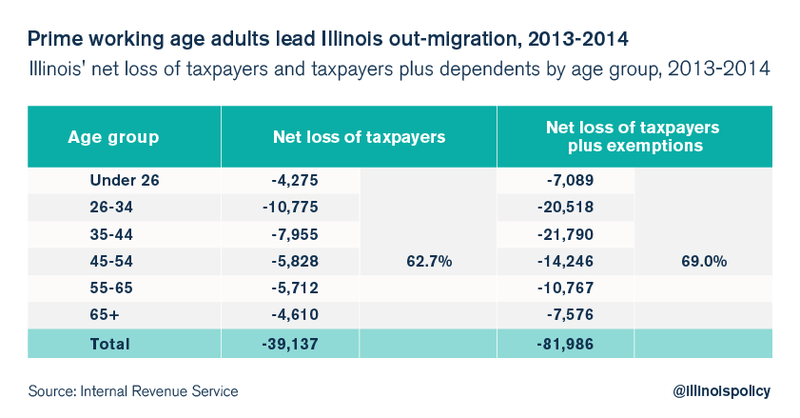 And as the new IRS data and Bureau of Labor Statistics, or BLS, information reveal, Illinois’ out-migration is heaviest among young and working-age adults. Clearly, workers are leaving Illinois for better job opportunities and more favorable economic climates elsewhere. The past three years of IRS migration records (2011-2012, 2012-2013, 2013-2014) have included enriched data that show the age and income level of people moving between states. These three years have also been record years of out-migration for Illinois, and provide a deeper view of who is leaving the Land of Lincoln. According to the IRS data, the majority of Illinois’ net loss of taxpayers is due to prime working-age adults leaving the state, with millennial taxpayers (under 35) leaving most rapidly of all age groups. Illinois had a net loss of 25,000 taxpaying households, 51,000 people (exemptions), and $2.7 billion of annual adjusted gross income, or AGI, for the 2011 tax year with tax returns filed in 2012. Prime working-age adults made up 64 percent of Illinois’ net loss of taxpaying households, and 71 percent of Illinois’ net loss of taxpayers plus dependents. The single biggest loss group of taxpayers was the millennial age group of 26-34. One year later, Illinois had a net loss of 32,000 taxpaying households, 68,000 people (exemptions), and $3.9 billion of annual AGI for the 2012 tax year with tax returns filed in 2013. Prime working-age adults made up 64 percent of Illinois’ net loss of taxpaying households, and 70 percent of Illinois’ net loss of taxpayers plus dependents. The single biggest loss group of taxpayers was once again the millennial age group of 26-34, and the loss of millennials and all other working-age adults increased significantly over 2011-2012 levels. In the third year of enriched data, Illinois had a net loss of 39,000 taxpaying households, 82,000 people (exemptions), and $4.2 billion of annual AGI for the 2013 tax year with tax returns filed in 2014. Prime working-age adults made up 63 percent of Illinois’ net loss of taxpaying households, and 69 percent of Illinois’ net loss of taxpayers plus dependents. The single biggest loss group of taxpayers was once again the millennial age group of 26-34, and the loss of millennials increased significantly over 2012-2013 levels. In addition, Illinois’ net loss of taxpayers under 26 rapidly increased over this three-year period. In sum, Illinois had a net loss of 96,000 taxpaying households and 202,000 taxpayers plus dependents over the three-year period of enriched IRS data. Sixty thousand of Illinois’ net loss of 96,000 taxpaying households were headed by prime working age adults, and another 7,500 of the net loss of taxpayers were headed by adults who were under 26 years old when they left. The fact that so many working age adults are leaving Illinois makes it clear that Illinois is not creating enough good job opportunities for them to stay. Illinois’ policy problems are most acute in the blue-collar industrial economy, but high taxes and regulations drive up the cost of living and hurt Illinoisans across ages and income levels. Until Illinois focuses on generating more growth and less government, the state will continue to create too few jobs and lose too many people.